My first one so it's kinda funky. Pretty easy to make. I made the little pills out of paper. I have so many ideas for making more hearts. I can put a tutorial up if anyone wants it. Tell me what you think! Sorry I don't have more pics I didn't think to make a tutorial until after...Ok first we need to make the glue for the papper mache. Mix one part flour and 5 parts water and boil for 3 minutes. Make sure to get out all the lumps and let cool. now to make the heart! I wadded up three balls of paper and taped them together and formed them into a heart shape. I'm assuming you guys know how to do paper mache...Just keep adding layers until it looks the way you want it. I left mine a little rough looking. I let it dry outside over night since it's like 100 degrees out! Now paint your heart, it took about 3 coats to over up the newspaper. I cut out a zipper from a old pair of pants that were too big. 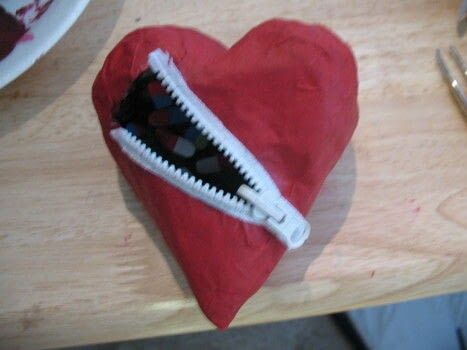 Place the partially unzipped zipper on the heart in the position you want it. I drew around the inside of the zipper so I knew where to cut. I left the zipper long and wrapped it around the back. Use a craft knife to cut along the lines. Now pat yourself on the back and do a happy dance cuz you're finished! Hi i thought that it was of fabric, but this is greater! I work too often with papier mâché and i'm always suprised what you can do with it. I thought maybay i can make one from old doils and then stiffened. I'm curious to know what your other plan are with this. Thanks for sharring. hehe ty glad you like it! Very cool! Verdict's in . . . we must have a tutorial!